Are you happy? Does your life have meaning? Sadly I hear people say, “My life is empty and disappointing.” As we try to fill our lives with possessions, power and pleasure we will find that life has let us down. 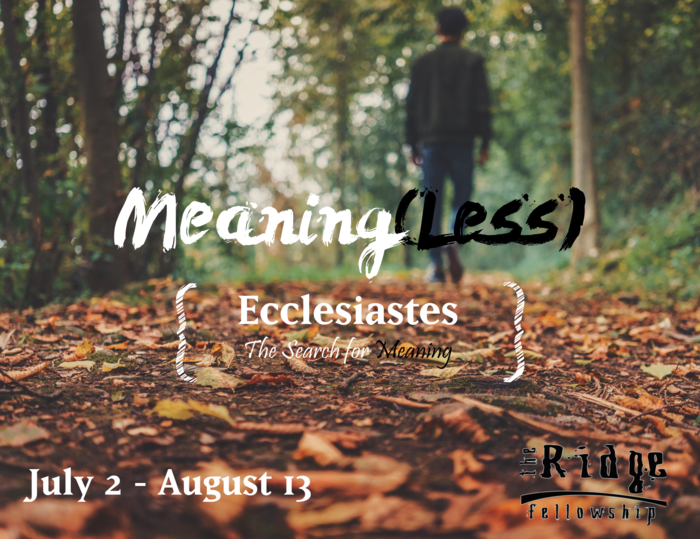 In the book of Ecclesiastes Solomon takes us on a mental journey through his life explaining how he tried and tested everything to find meaning and enjoyment in life. He tries to spare his readers the same disappointment he learned through personal experience. Everything apart from God is empty and meaningless. Solomon has an honest approach to life. His comments may come across as negative but his attempt is to lead people to center their lives around God. Not any substitutes. He affirms the value of education, pleasure, work and possessions, but only in their proper place. All of these things must be seen in the perspective of God’s purpose. True enjoyment of life is comes from knowing that what we are doing is part of God’s purpose for our lives. From the human point of view (“under the sun”), life does appear futile; and it is easy for us to get pessimistic. The Jewish writer Sholom Aleichem once described life as “a blister on top of a tumor, and a boil on top of that.” You can almost feel that definition! Life is “not in vain” if it is lived according to the will of God, and that is what Solomon teaches in this neglected and often misunderstood book. Nowhere in this book did the author give his name, but the descriptions he gave of himself and his experiences would indicate that the writer was King Solomon. He called himself “son of David” and “king in Jerusalem” (1:1, 12), and he claimed to have great wealth and wisdom (2:1-11, and 1:13; see 1 Kings 4:20-34 and 10:1). In response to Solomon’s humble prayer, God promised him both wisdom and wealth (1 Kings 3:3-15); and He kept His promise. What is the practical application of this book for us today? Is Ecclesiastes nothing but an interesting exhibit in a religious museum, or does it have a message for people in the Space Age? Its message is for today. After all, the society which Solomon investigated a millennium before the birth of Christ was not too different from our world today. Solomon saw injustice to the poor (4:1-3), crooked politics (5:8), incompetent leaders (10:6-7), guilty people allowed to commit more crime (8:11), materialism (5:10), and a desire for “the good old days” (7:10). It sounds up-to-date, doesn’t it? If you have never trusted Jesus Christ as your Savior, then this book urges you to do so without delay. Why? Because no matter how much wealth, education, or social prestige you may have, life without God is futile. You are only “chasing after the wind” if you expect to find satisfaction and personal fulfillment in the things of the world. “For what shall it profit a man, if he should gain the whole world, and lose his own soul?” asked Jesus (Mark 8:36). Solomon experimented with life and discovered that there was no lasting satisfaction in possessions, pleasures, power, or prestige. He had everything, yet his life was empty! There is no need for you and me to repeat these experiments. Let’s accept Solomon’s conclusions and avoid the heartache and pain that must be endured when you experiment in the laboratory of life. These experiments are costly and one of them could prove fatal. When you belong to the family of God through faith in the Son of God, life is not monotonous: it is a daily adventure that builds character and enables you to serve others to the glory of God. Instead of making decisions on the basis of the vain wisdom of this world, you will have God’s wisdom available to you (James 1:5). As far as wealth and pleasure are concerned, God gives to us “richly all things to enjoy” (1 Tim. 6:17). “The blessing of the Lord makes one rich, and He adds no sorrow with it” (Prov. 10:22, nkjv). The wealth and pleasures of the world do not satisfy, and the quest for power and position is futile. In Jesus Christ we have all that we need for life and death, time and eternity. If there is one truth that Solomon emphasizes in this book, it is the certainty of death. No matter what Solomon enjoyed or accomplished, the frightening shadow of death was always hovering over him. But Jesus Christ has defeated death and is “the resurrection and the life” (John 11:25). The victory of His resurrection means that our “labor is not in vain in the Lord” (1 Cor. 15:58). If you don’t know Jesus Christ as your Savior, then all that you work for and live for will ultimately perish; and you will perish too. But faith in Jesus Christ brings you the gift of eternal life and the privilege of serving Him and investing your years in that which is eternal. So, the first message of Ecclesiastes is: turn from the futility of sin and the world, and put your faith in Jesus Christ (John 3:16; Eph. 2:8-10). But if you are a believer in Jesus Christ and have received the gift of eternal life, then Solomon asks you, “Are you living for the Lord or for the things of the world?” Remember, Solomon knew God and was greatly blessed by Him, yet he turned from the Lord and went his own way. No wonder he became pessimistic and skeptical as he looked at life! He didn’t have God’s perspective because he wasn’t living for God’s purposes. More than one professed Christian has followed Solomon’s bad example and started living for the things of this world. When you start living for the world instead of for the will of God, you begin to look at life from the wrong perspective: “under the sun” and not “above the sun.” Instead of seeking those things which are above (Col. 3:1), you start majoring on the things that are below. This wrong vision soon causes you to adopt wrong values and you stop living for the eternal. The result is disappointment and defeat; the only remedy is repentance and confession of sin (1 John 1:9). That need not happen to you! King Solomon has already explored the road exhaustively and given us a dependable map to follow. And if we follow God’s Word, we will be satisfied. What will life be for you: vanity or victory? This entry was posted in Meaning(less) - Ecclesiastes and tagged Ecclesiastes, meaning, purpose, Solomon, wisdom. Bookmark the permalink. 2 Responses to Is Life Worth Living? Regardless of Christianity it does not relieve them from, nor does it prevent, constant pain in their lives. Life is better to never have been. People will always experience pain (harm) which outweighs any pleasure. Not coming into existence means people will not experience pain, nor will they be disadvantaged by not experiencing pleasure as they do not exist. True, pain is a constant in life. But since we can’t stop people “coming into existence” after they are here, I do believe that once they are here, they can experience comfort, hope, love and encouragement from loving people and a loving God.